Terriers combined three first-period goals and 60 minutes of strong defense to produce a 4-1 win in the deciding game of the quarterfinal series at Lowell. Patrick Harper led the offense with two goals and an assist, while Jake Oettinger produced another standout effort in goal. BU advances to the Hockey East semifinals next Friday at TD Garden and, thanks to BC’s upset of Providence, will face #2 seed Northeastern. BU set the tone early in the first period. Harper took a pass from Logan Cockerill at his own blueline, sped into the offensive zone on an odd-man rush and slid the puck to Chad Krys in the right circle for a one-timer that beat Chris Hernberg. Midway through the period, Cockerill redirected a shot into the Lowell net, but it was disallowed on a stick above the shoulder call. Minutes later BU got that two-goal lead when Joel Farabee took a pass from Krys, skated up left wing with one defenseman back and lasered a shot past Hernberg high to the glove side. Cam Crotty picked up the secondary assist on Farabee’s team-leading 17th goal. Late in the period, after Ty Amonte had a pair of grade-A chances stopped by Hernberg during the game’s only power play, Patrick Curry set up Harper whose wrister from the slot found net for a three-goal lead. 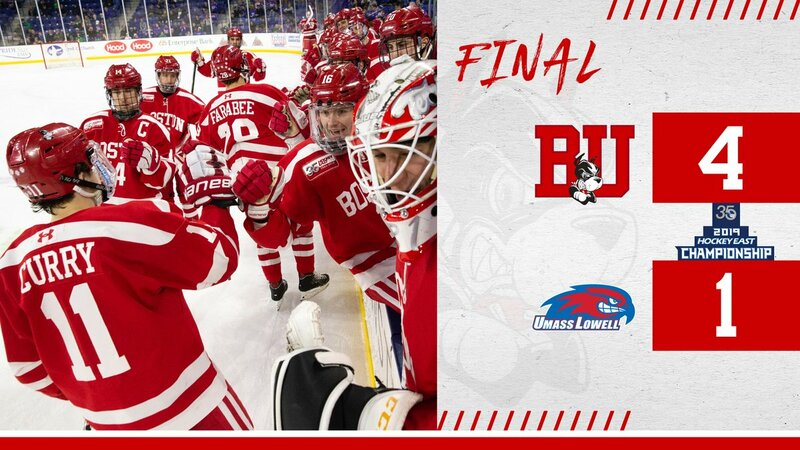 BU had outshot the River Hawks 13-3, aiding Oettinger with a bunch of blocked shots. After a scoreless second period, BU was just 20 minutes from a return to the conference semifinals. Early in third, David Farrance sent Curry in alone on a breakaway but his backhander was turned aside by Tyler Wall who had replaced Hernberg. At the eight-minute mark with BU on a line change, Lowell’s Connor Wilson stopped Crotty’s attempt to clear the puck out of the zone and found Kenny Hausinger in the right circle. His shot beat Oettinger high to the glove side, cutting the lead to 3-1. Just over a minute later, Oettinger was tested on a shot by Jon McDonald, but kicked the shot away. With Wall pulled, Cockerill and Harper had a 2-on-none and Cockerill gave up the puck to his teammate for his second goal of the game. BU, which is now 8-2 in quarterfinal game threes since 2000, is the first school to make 25 appearances in the Hockey East semifinals. Oettinger stopped 18 of the 19 shots he faced, with his defense blocking 14 attempts. 2019 recruit Trevor Zegras scored his 21st goal—and 70th point of the season— in the NTDP U18s’ 13-1 rout of Green Bay. Dom Fensore assisted on three goals and was +4 for the game. Case McCarthy also had a helper. 2019 recruit Robert Mastrosimone scored his 27th goal in Chicago’s 3-2 win against Dubuque. 2020 recruit Drew Commesso stopped 22 of 23 shots in the NTDP U17s 2-1 shootout loss to Cedar Rapids, yielding only a power play goal in regulation and overtime. Fellow recruit Dylan Peterson assisted on the U17s’ goal. Evan Rodrigues scored his ninth goal and Jack Eichel had a shootout goal in Buffalo’s 4-3 win against the Blues.